We’re starting off our Purdue Grand Prix coverage at the results of the first regular practice on April 7, 2015. See all the best times below. We talk with members of Acacia Racing, Tarkington Halberdier Club, Phi Sigma Rho, ASME, and Pike Racing. 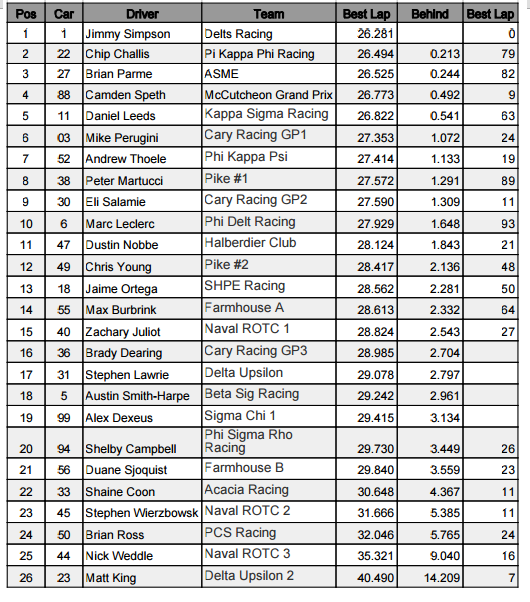 Below in jpeg format, we have the unofficial results from free practice 1 of the Purdue Grand Prix. Check out the Purdue Grand Prix and all their social media links.